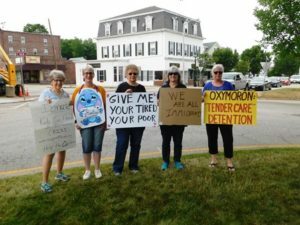 Westborough – A group of approximately 30 residents gathered at the rotary June 20 to protest the Trump administration’s controversial policy on separating migrant children from their parents after the families have entered the country illegally at the Texas border. 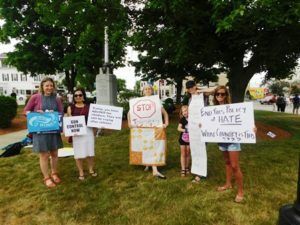 Although no counter protesters joined the event, a few dissenters showed their displeasure at times, organizers said. But for the most part commuters were positive, beeping their horns in approval and giving a thumbs up. 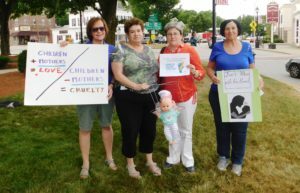 The protest was organized by Westborough resident Cristin Hodgens, who after participating in last year’s Boston Women’s March, formed the statewide advocacy group Wave of Women. 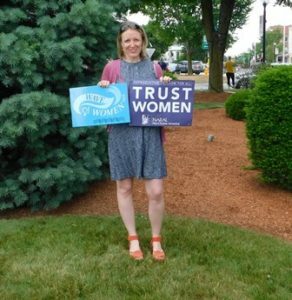 Although the name is Wave of Women, the group is nonpartisan and inclusive of all, she stressed. Gibbs Mitchell decided to quickly create a sign and join the protest at the rotary, he said, after hearing about it from a neighbor. 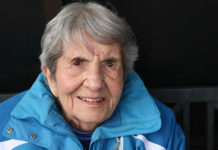 For more information on Wave of Women, visit www.waveofwomen.org and on Facebook at WAVE of Women- Westborough, MA.